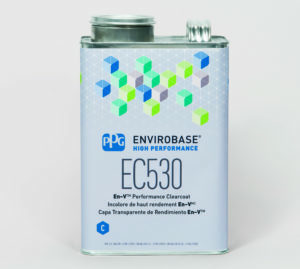 PPG’s clearcoat is designed to absorb ultraviolet light and protect your paint job, but the substance will be fighting a losing battle without sufficiently thick film, PPG chemists advised Thursday. “It’s really critical” to build 2 mils of clearcoat, if not more, coatings chemist Jack Dickens said during a special Society of Collision Repair Specialists OEM Collision Repair Technology Summit event during SEMA. UV light can set off a chemical reaction and break down bonds in the basecoat, and “you start to lose your properties,” Dickens said. To prevent this, PPG packs its clearcoat with UV-absorbing chemistry and a secondary ability to “clean up” when the bonds do break, according to Dickens. “It’s kind of the fail-safe,” Dickens said. Dickens said the typically recommended amount ranged between 2 and 3 mils. Three mils “gets you into some other issues,” such as sag, he said. “Popping” is also a consideration then, PPG Americas Technical Director Gareth Hughes said. The 2 mils would have to endure after milling, Hughes clarified to an audience member. A shop desiring to cut and buff would need to start with enough to be left with 2 mils, collision segment marketing director Jennifer Boros said. Put 15 mils and sand off 13 if you want, but “the finished product has to have 2 mils,” Hughes said. Hughes said PPG tries to design its clearcoat so painters aren’t struggling to achieve 2 mils with only two coats. However, a cheaper clearcoat could have less UV protection, as it’s “costly,” Boros said. The manufacturer might also have stripped out resins to the point that two coats would barely produce 1.5 mils. U.S. Collision Segment application support specialist Darin Poston said repairers could tell a lot from the amount of solids within a coating. At 40 percent or more, it should be a “pretty good product.” At 35 percent or less, the painter will probably need more than two coats to make 2 mils, he said. Hughes said that paint companies could design a clearcoat able to block UV light with just 1.5 mils, but the absorption would end up reaching the visible spectrum and the clearcoat — and the car — would look orange. One other note: Standard clearcoat won’t cut it for carbon fiber substrates, according to Hughes. Without a special UV absorber, the carbon fiber will break down — and that protection has “four zeros in the price,” he said.